An Emory Continuing Education (ECE) instructor is no longer affiliated with the University after it began an investigation into her blog, which promotes views against several minority groups. Vice President of Academic Communications Nancy Seideman wrote in a Jan. 31 email to the Wheel that the University is investigating the situation. “We are aware of the situation and are looking into it,” Seideman wrote. The profile had more than 3,100 subscribers and 1.1 million views as of Tuesday night. Corvino teaches Basic Italian Grammar and Italian Opera Appreciation at Osher Lifelong Learning Institute (OLLI), a program located at Emory’s Executive Park campus. The program allows adults to earn a certificate for “professional development,” instead of a traditional diploma, according to OLLI’s about page. She also teaches classes in Dunwoody and Midtown Atlanta, according to her teaching website. Corvino has taught Italian at Georgia Perimeter College, International Language Institute and Language Institute of Atlanta, according to her Emory biography. 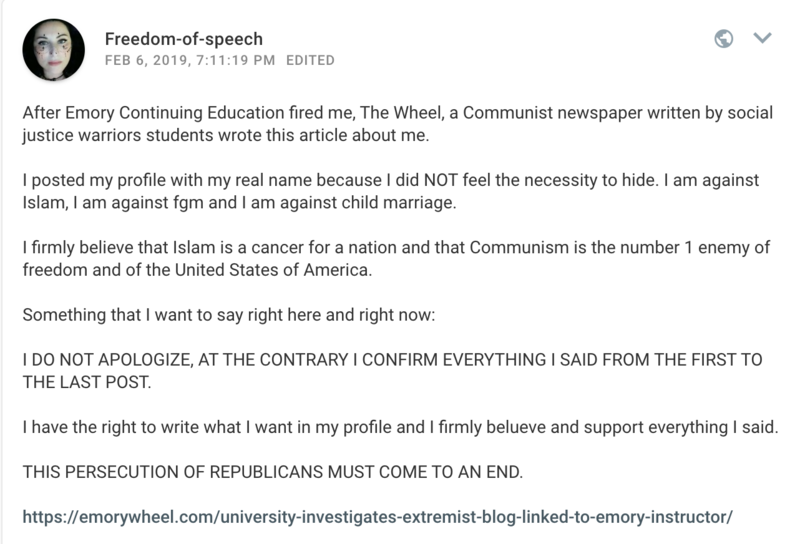 Keynon Burns, who notified the Wheel about the profile and is unaffiliated with Emory, wrote in a Jan. 24 email that he believes the profile is troubling. Burns contacted Emory with his concerns about the profile. ECE Program Manager Jeffery Alejandro did not respond to the Wheel’s request for an interview. ECE is not affiliated with the Emory College of Arts and Sciences’ Department of French and Italian. Update (2/6/19 at 11:02 a.m.): Laura Corvino is no longer affiliated with the Emory Continuing Education program, Vice President of Academic Communications Nancy Seideman wrote in a Feb. 6 email to the Wheel. Update (2/7/19 at 3:46 p.m.): This article has been updated to include Corvino’s blog post about her termination.